Fancy Pants Foodie is proud to be the Official Blog Partner for The Next Course, a cooking-themed fundraiser event on October 3 to raise funds for a generator to power the Youth Home, Inc. campus in the event of a power emergency. The event will feature local chefs teaching attendees how to prepare the gourmet courses they will serve at the event. Tickets are available here for purchase. More information on our previous post here. As you may know, I have been heavily involved with Cooking Matters over the past couple years, mostly teaching their class for childcare professionals. One of the biggest themes in the class is to encourage routine, especially surrounding mealtimes. This creates a sense of security and structure that translates almost immediately to other areas of a child’s life. Seating area of the cafeteria, which was shut down last winter by a power outage. Now, imagine that you are one of the 70 children living at Youth Home, Inc., a residential and day-treatment center in Little Rock for young people ages 12 to 17 with psychological disorders. It’s the winter of 2012-13, and Christmas brought a couple feet of snow (and a resulting power outage) that Arkansas just wasn’t ready for. If you’re a boy, you were moved into the one room of the campus’ school building that had a small working generator. If a girl, you were sent to a nearby church which graciously offered its facilities. The usual structure of the day, engineered to the minute by the center’s caring and able staff, was completely disrupted. 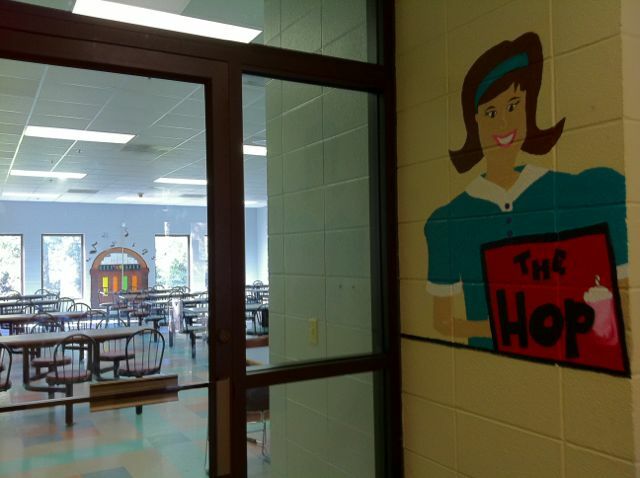 Cafeteria service for residential patients halted after last winter’s heavy snow. All perishable food in the area was lost. The Youth Home kitchen, usually a bustling hub of comfort and nourishment, was cold and dark, without power for several days. All the perishable food there was lost, and the emergency food in the center’s houses was soon depleted. 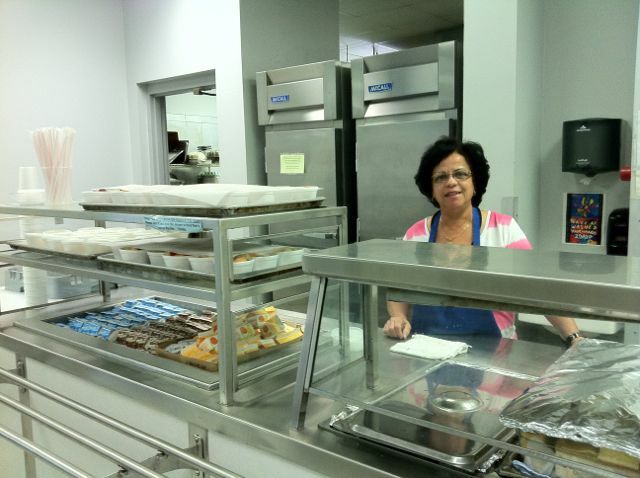 The earlier mentioned church saved the day by preparing and delivering daily meals. Now imagine you have post-traumatic stress disorder or reactive attachment disorder. 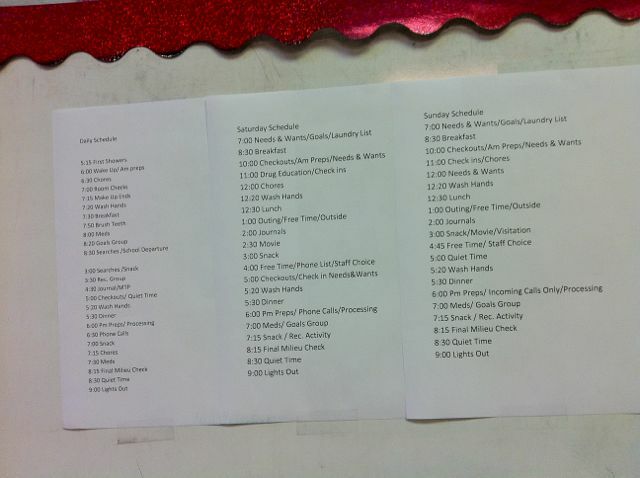 The important daily schedule in one of the girls’ residences. Stephanie Jonasson, development assistant for Youth Home, recalled how the extended power outage affected the children. She said that the leadership and routine of the campus helped most of the children continue as normally as possible, but because of the nature of their conditions, some children had a very hard time. I had the opportunity to tour Youth Home this week, and I am overwhelmed with the facility, their staff, and the success of their work. 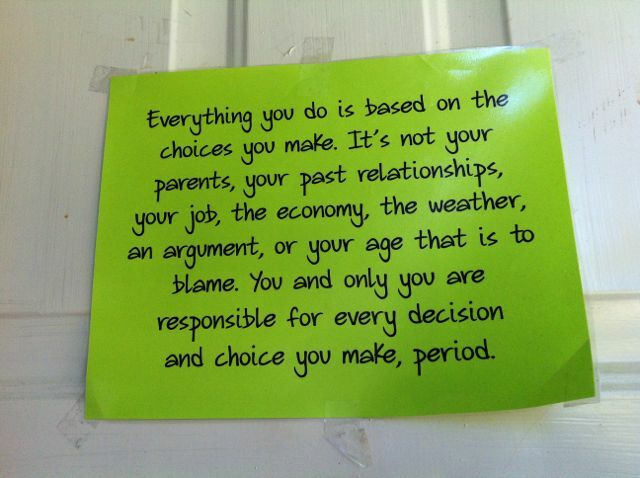 Most impressive is Youth Home’s commitment to lovingly empower these youth to take responsibility for their own lives. Again and again, throughout every element of the program, the child must intentionally make decisions and understand the consequences, good or bad. Sign on the front door of a girls’ residential building. In the residence halls, where 12 boys or girls live under the care of four direct care staff (as well as medical and psychiatric care staff), rules are clearly posted. Some infractions get smaller punishments, such as staying at a desk to write about your decision. Others are met more severely, with isolation or reduction of “transition level.” Each resident works weekly toward the next transition level, offering more freedom and privileges. In Youth Home’s Siebert Educational Center, students are empowered to believe they can learn and are expected to do their best. We saw small-ratio classrooms with SMART Boards plowing away at math, language and keyboarding. Honestly, I was amazed to find out that some of the calm, attentive students I saw had been violent and unruly in other environments. Program Manager Brenda Griffin explains the impact their programs have on troubled teens. Brenda Griffin, program manager for Youth Home and leader of our tour, explained the system of trust they have with the children to achieve this change. “If you make the environment predictable, with rules and consequences, they will respond,” she added. It’s not all rules and hard lines at Youth Home. The staff offers love and hope to the children in their care, many of whom had never received such hope before. Many of the kids coming into the facility are in crisis. Some may be engaged in self-mutilation (cutting or other physically destructive behavior). A good number are suffering from some form of depression. 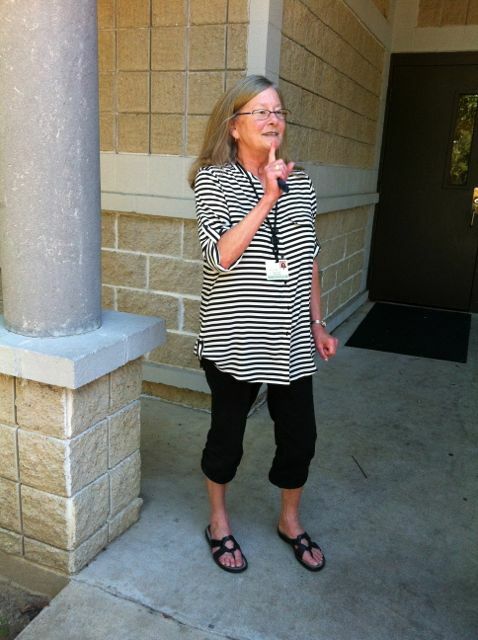 The staff not only builds up each child, but they also help the kids to encourage each other. A residence hall director told us about her girls’ “Encouraging Words” time, held after every group session. During this time, the girls take turns saying nice things about each other, whether it’s a compliment about her hair or a shout-out for reaching her personal goals for that day or week. So, what does all this have to do with you? I hope you have a tiny glimpse of what good Youth Home is doing, and how important it is that we help them continue their work free of disruptions. Last winter’s storm revealed an emergent need for a generator large enough to power the entire campus if needed. On Thursday, October 3, Youth Home will partner with Ben E. Keith and the Clinton Presidential Center for The Next Course, a fundraising event to purchase this generator. Join us and you will enjoy a seated dinner with several courses of seasonal deliciousness, and chefs from the partner organizations will demonstrate to the attendees how to make the food at home. You’ll even get a set of snazzy recipe cards in case you forget anything you learned. Please click here to buy tickets to this exciting and important event. Help Youth Home continue to empower the children in their care, no matter what the weather brings. 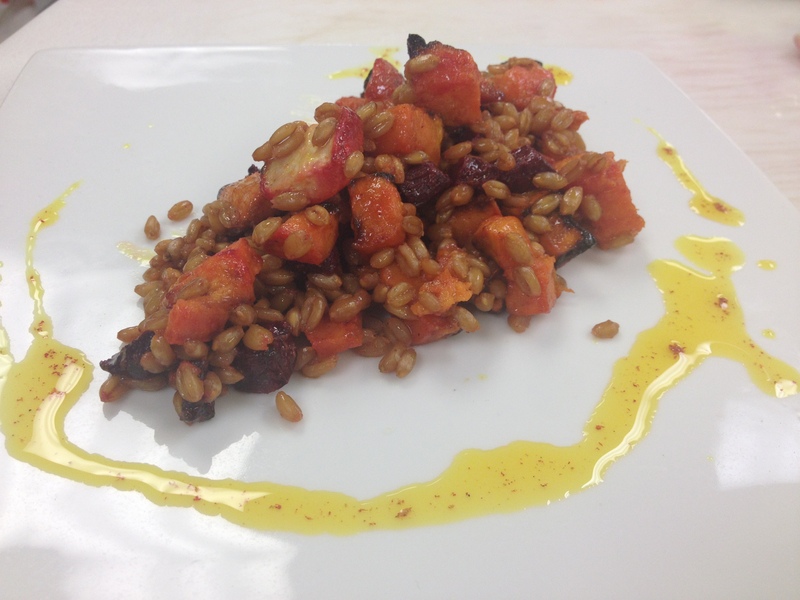 Roasted Root Vegetable and Farro Salad, to be served and demonstrated at The Next Course for Youth Home. In a delightful new fundraiser format, the upcoming The Next Course gala event for Youth Home will not only feature amazing, seasonal food from local chefs, it will teach attendees how to make each course at home. Last week, I got a sneak peek at some of the courses and the instructional videos that will be shown during the event. I’m not allowed to spill the details just yet, but I can tell you two things: 1) the food will be fresh, seasonal and stunning, and 2) you WILL learn something, even if you don’t cook. Okay, maybe that was more than two things. Just trust me, it will be an amazing event. As guests enjoy each course of the dinner, they will receive video how-tos to recreate the dishes themselves by Chef Shane Henderson of Ben E. Keith and Chef Stephen Burrow of the Clinton Presidential Center, along with his Sous Chef Jackson Bolton and Pastry Chef Anne Woodson. Guests will also take home detailed recipe cards for each dish. Youth Home is a private, non-profit psychiatric center for emotionally troubled adolescents and their families. With state-of-the-art residential treatment, as well as day and outpatient services, Youth Home serves an important role in the wellness of our community. During last winter’s snowstorms, the facility went without power for several days, causing a major setback for the facility and its residents. Food went bad. Medicine ruined. And spirits dampened. With funds raised by The Next Course, Youth Home will purchase power generators to avoid a similar situation in the future. As the Official Blog Partner for the event, Fancy Pants Foodie will bring you more stories about Youth Home and The Next Course. I hope you’ll stay tuned for that. But more importantly, I hope you’ll buy a ticket or two, or even sponsor a table. Join us at The Next Course, learn a few things, and help improve the lives of young people right here in Little Rock! Chef Marc Guizol of Capitol Hotel in Heat #5 on Thursday. Guizol went on to win the final round of the competition. The Arkansas Hospitality Association Convention and Trade show is an annual flurry of chefs, hospitality professionals and tourism folk. It’s kind of my happy place. Having worked in PR (lots of those folks here), museums and tourism (yep) and now the culinary arts (they’re swarming this place), it’s no surprise. The highlight of the trade show is the Iron Chef competition, set up right this minute in the very middle of the Statehouse Convention Center floor. Every year, chefs vie for top billing in this highly competitive secret-basket event. It’s a great learning experience for any cook, seeing how one might take a random basket of ingredients (say, what you might already have in your house on a given day) and make something otherworldly. Below, I have listed the competitors, the baskets and the single eliminated chef from each round. I will update today as the winners are revealed. Chef Jackson Bolton was eliminated. 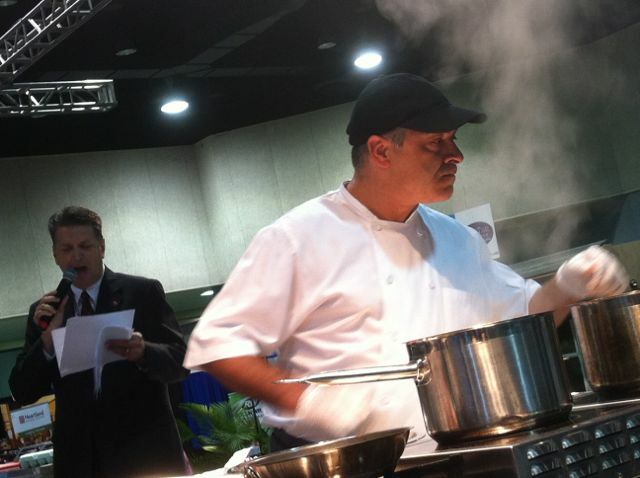 Chef Jeff Stephens was eliminated. Basket: Chicken thighs, green lentils, tri-color baby carrots, apple. Chef Michael Brown was eliminated. Basket: Ribeye steak, orange, fingerling potatoes, A-1 sauce. Chef Jon Lamb was eliminated. Basket: Shrimp, linguine, watermelon, watermelon cucumber, dragonfruit. Chef Matthew Cooper was eliminated. Chef Shane Curley was eliminated. Final will be Chef Marc Guizol of Capitol Hotel vs. Chef Justus Moll of River Grille. 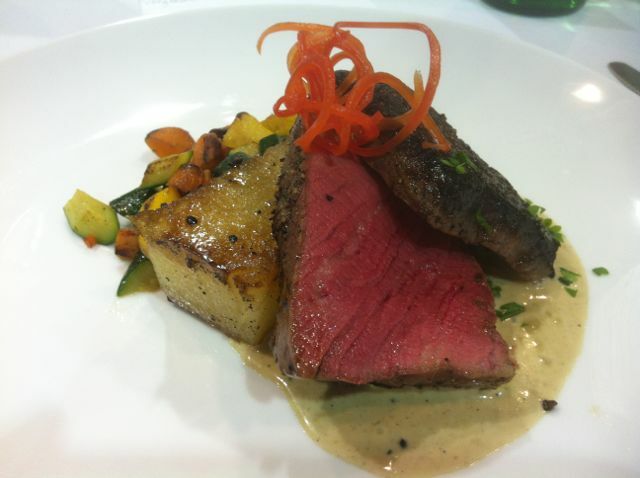 Smoked, pan-seared beef tenderloin with fondant potatoes and baby vegetables by Jason Knapp, Aramark/UCA. Looking for the winners? Jump alllll the way down. Yesterday, I had the amazing privilege of being on the panel of judges at the Arkansas Hospitality Association‘s annual Culinary Classic competition. It kind of freaked me out. I’ve had several opportunities to judge food competitions in recent years, and I’ve turned them down since going gluten-free. I didn’t want to risk bloating and bleh. But when the amazing Holly Heer of AHA offered, I was NOT going to say no. I’d figure it out. The panel of 12 included excellent chefs such as Jason Godwin (now at Alltel) and Donnie Ferneau (formerly of Ferneau/Rocket 21, now consulting and preparing for his own new place), esteemed writers such as Kelley Bass (formerly of the Arkansas Gazette, Dem-Gaz and Arkansas Times), and industry giants such as Bob Coleman (retired from Coleman, now Hiland Dairy). What the heck was I doing here? 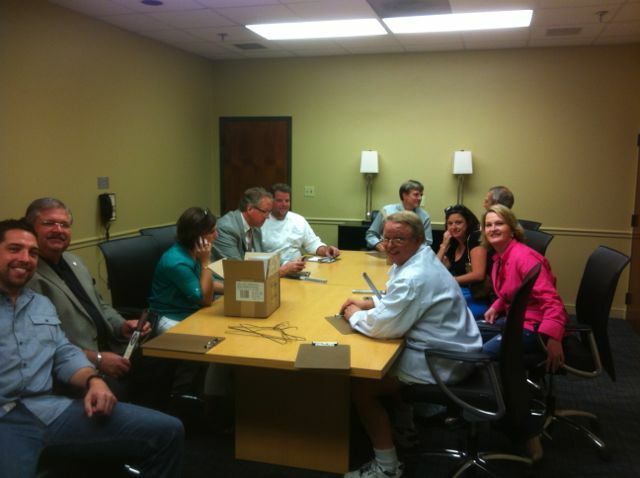 That’s me in the silly hot pink chef coat, waiting with the other judges before the event. We chose what category we would judge. I figured, rightly, that entrees would be the least glutenous. Good call. But would I know enough to properly judge the hard work these chefs had put in? I knew they were sweating behind those black curtains, wondering if we would taste and appreciate everything they had done. This was a big deal for them, I knew. Judges at the appetizer course table. As the entrees started to come out, I slowly started to realize that I may know a thing or two after all. 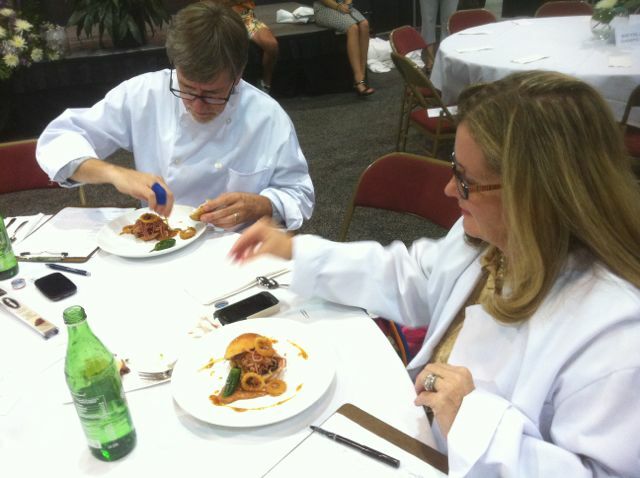 My fellow judges and I discussed some of the hits and misses of each dish. Because of my excellent education at Pulaski Tech (and probably a good bit from Good Eats and my own experience), I was able to describe the tiny “just off” things the other judges and I noticed in these otherwise spectacular dishes: A dish that was smoked but maybe should have been braised. A piece of beef that would have benefited from a different cutting method. An overcooked fond that created a slightly bitter pan sauce. I should clarify that these were minor errors of technique, mere landing hops in the culinary olympiad that separated the winners from the others. I want all the participants in the Culinary Classic to know that this was a very hard job, one that we all took seriously. Each dish was stellar and a joyous representation of the culinary talent in our state. But I came away more confident, knowing that I knew good technique when I saw it. Some kind words from Chef Ferneau also bolstered my confidence, as he encouraged me to enter the contest myself one day. We’ll see. NOTE: I did not know who made each dish until after judging. It’s Finally Here! 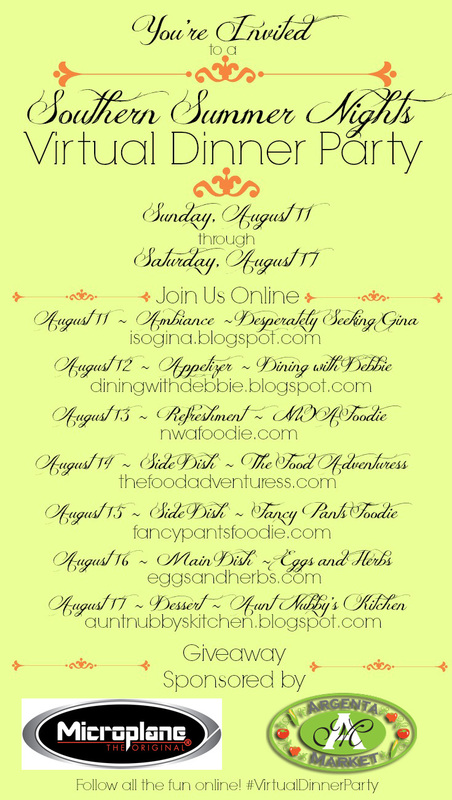 Welcome to the Southern Summer Nights #VirtualDinnerParty! I’ve hinted on Facebook and Twitter about this week’s awesome dinner. Are you hungry? I hope so. Starting today, some of Arkansas’ best food bloggers are sharing dishes as part of the Southern Summer Nights Virtual Dinner Party (follow on Twitter at the link). It’s a progressive dinner of sorts, with one delicious dish each day! You can also follow along at each of these bloggers’ sites on the appropriate day. Below are links to each participant’s blog website; check my Facebook and Twitter each day for links to the specific blog posts. Today, check out Gina Knuppenburg’s amazing work over at Desperately Seeking Gina in setting the mood for a great party. I may be able to cook, but there’s one thing I stink at and it’s decoration. Gina’s got it covered in this amazing how-to on making cloth flower place settings. 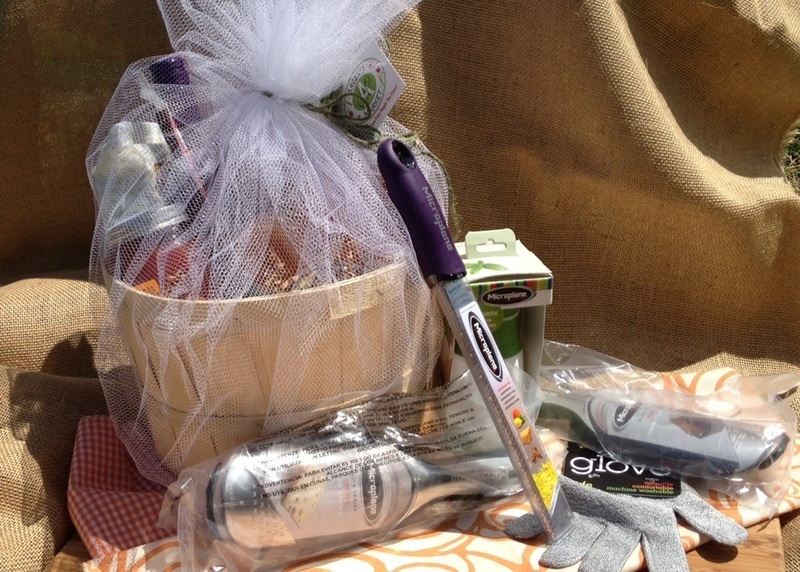 Great prizes from Argenta Market and Microplane that could be yours! And Gina’s post is your first chance to enter our giveaway from Microplane and Argenta Market! Microplane is offering an $85 prize pack, and Argenta Market is giving away a $75 all-Arkansas gift basket. I’m a big fan of both companies, and I wouldn’t participate in giveaways of products that I didn’t love. Check back on each blogger’s featured day to enter again. Of course, I’m especially hoping you’ll join me here on Thursday for a show-stopping side dish celebrating Arkansas food. In a funky way. I can’t wait to show you! Hope you enjoy…I’m getting hungry already! Chefs are a funny lot. They’re often known for being fussy, ill-tempered or demanding. I’ve been around more than a handful, and even the more even-tempered ones often get a little hairy when it’s time to cook. And then there’s Justin Patterson of Southern Gourmasian. 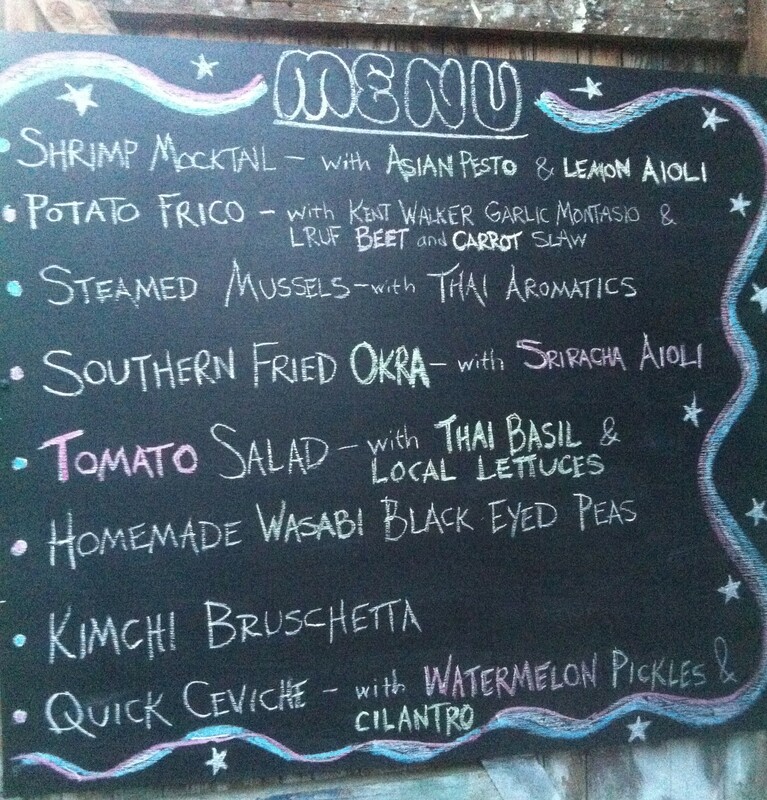 Menu from the Little Rock Urban Farming event featuring Southern Gourmasian. Working in an unusual setup inside Little Rock Urban Farming’s garage-barn-event room Saturday night, Justin was as calm and cool as a cucumber fresh out of the abundant adjoining gardens. The event, a fundraiser for Little Rock Urban Farming’s new non-profit venture, the Southern Center for Agroecology, was equally laid-back, with visitors in t-shirts, suits and sundresses touring the unassuming Hillcrest digs. Our cooking space intertwined with the guests’ buffet of buttermilk fried okra, steamed mussels and fresh, ripe sliced tomatoes, picked just feet away. Open doors allowed a slight breeze with hints of basil from the rows just outside. Also on the menu was a crispy cheese-and-potato pancake of sorts (a frico, I learned), which Justin had me assemble. I should note that all the hard parts — the lengthy prep of peeling and grating potatoes and slicing beets and carrots, just to start — had already been done. I got the heady honor of putting it all together and serving it to guests, who often wandered a little too close as I flipped them on the cooktop. 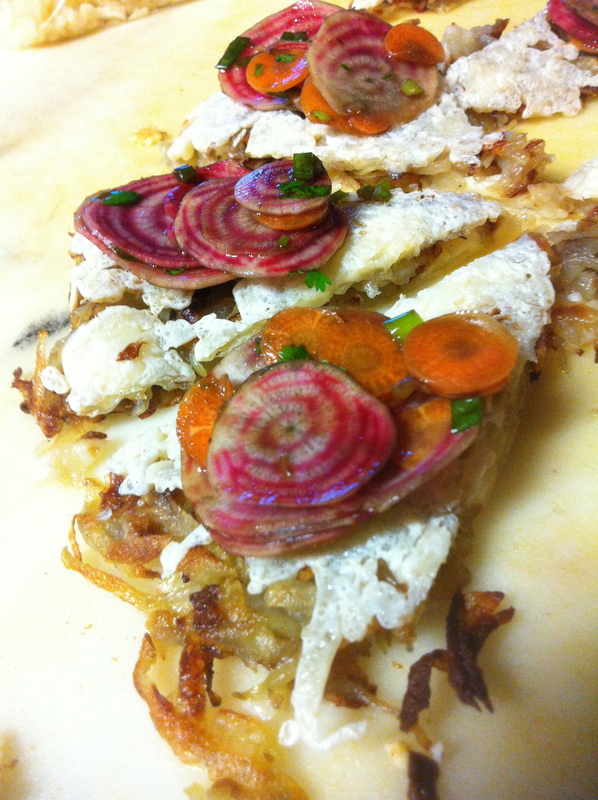 The frico dish featured garlic montasio by local cheesemaker Kent Walker, as well as a gorgeous slaw of candy cane beets and carrots grown right there at Little Rock Urban Farming. It was just one of several simple yet brilliantly devised dishes celebrating the local harvest. And that was just the idea, according to LRUF founder Chris Hiryak, waxing poetic before the event began. “One of the most beautiful things you can do with locally grown produce is put it in the hands of a chef who really transforms it,” he said. It helps when the chef is a calm, creative genius. More on that and his excellent staff next time. 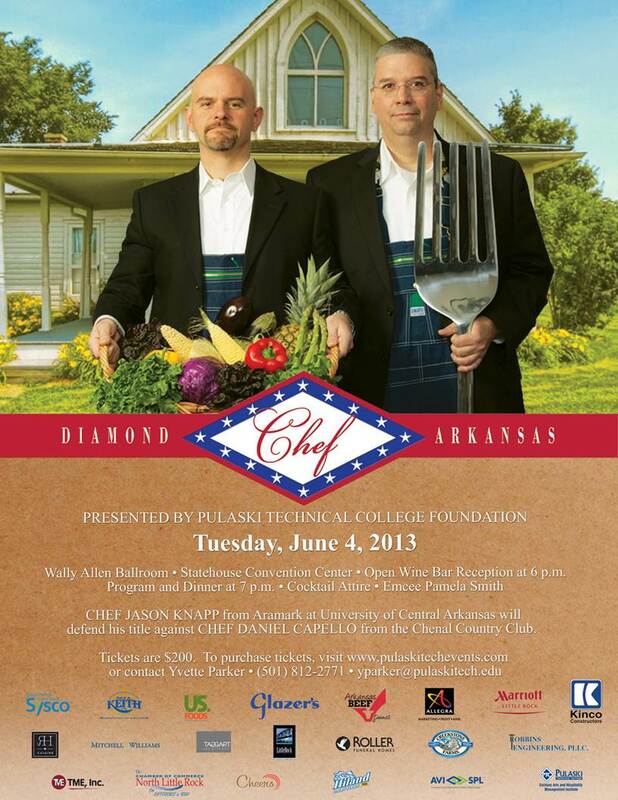 It’s time again for one of the best culinary events of the year, Diamond Chef Arkansas, which will take place on Tuesday, June 4 at the Statehouse Convention Center. The event benefits the Pulaski Technical College Foundation. Tickets are $200 and can be purchased online. The preliminaries to this event were held in February at the then-Peabody Hotel, with Chef Dan Capello of the Chenal Country Club winning the elimination-style competition. The final event next week will pit Capello against last year’s winner, Chef Jason Knapp of Aramark at the University of Central Arkansas in a live-action dinner throwdown. If you’re also a sucker for silent auctions like me, there will be plenty. Items range from glassware and kitchen gadgets to fine dining and wine pairing experiences. The fairly-infamous live auction also brings in the heavies, bidding on elaborate in-home dinners and even food-related travel. Someday, when I’m rich and famous, I’ll bid on the trip to The French Laundry that sometimes comes up. Should you go? Um, yes. If $200 is too rich for your blood (and you’re not a culinary student who can schlep in for free), ask your employer to sponsor a table, or get all friendly-like with one who already has. And now, my confession…I’ve live-blogged this event for years, and this time I will be on family vacation. It just turned out that way. I expect the good PR folks at Pulaski Tech will tweet and such, so give them a follow if you can’t get yourself to this outstanding event. Have you ever wondered what it’s really like to be food insecure? Ever get into a discussion about public policy that affects nutrition assistance programs? Did you ever want to do understand more, and thereby do more? 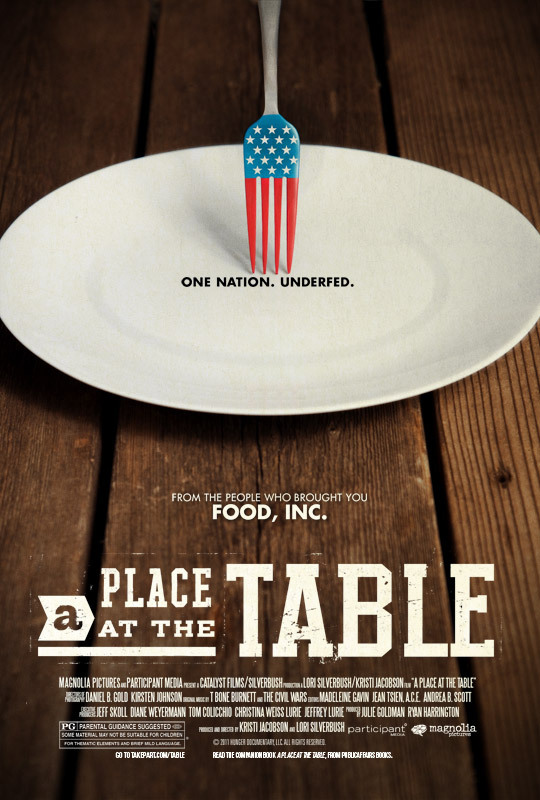 On Thursday, June 6, the Market Street Cinema in Little Rock will screen A Place at the Table, an acclaimed documentary directed by Kristi Jacobson and Lori Silverbush that has revealed the reality of hunger to many, through the eyes of three people who are unsure just where their next meal might come from. The documentary has received praise for its poignant look at this difficult issue, cutting through politics and rhetoric to expose the reality of living day to day with hunger. The screening is free, and you will have the opportunity to contribute to the Arkansas No Kid Hungry campaign to help end hunger in our state. Seating is limited to the first 200 people, so please RSVP by email here with the subject line “TABLE.” This will reserve your seats for the screening and the Q&A discussion of hunger in Arkansas that follows. The event was organized by the Department of Human Services Division of Child Care and Early Childhood Education Health & Nutrition Unit, the Arkansas Hunger Relief Alliance and the Arkansas No Kid Hungry Campaign. 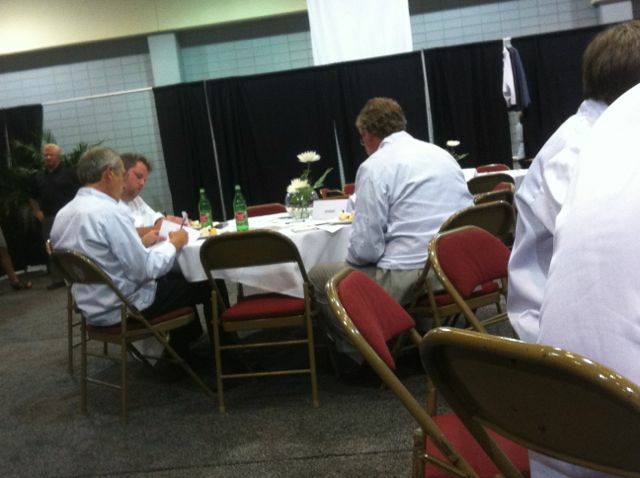 Ever wonder what happens when you feed central Arkansas chefs at night? Just kidding. But they can get pretty crazy. This video is of a recent event by the Central Arkansas Chapter of the American Culinary Federation (read: chef professional association). Led by Chefs Suzanne Campbell and Cynthia Malik on behalf of the ACF’s Chef and Child Foundation, this group held a public event in the Argenta area of North Little Rock promoting real food, exercise and culinary arts. The Foundation aims to bring chefs into schools and communities to help fight obesity and malnutrition. Watch and enjoy, and let me know in the comments if your school or organization would be interested in a chef-led educational event. No promises, but between myself and this group of folks, we may be able to work something up! Beautiful setup by Gina Knuppenburg and Amanda Potter Cole, and many other workers. I can’t thank you enough. I’m still exhausted, two days later. The Arkansas Food Blogger Bake Sale for No Kid Hungry, our third annual, was a huge success! I’ll report a total at the end of the week, but I do know that we have reached our goal of $2,000 this year, DOUBLING what we had made in each of our first two years doing the sale here in Arkansas. So exciting! Many thanks to the bloggers who wrote, baked and donated, as well as the professional bakers who sent their wares and a handful of non-blogger good souls who just sent things because they cared. 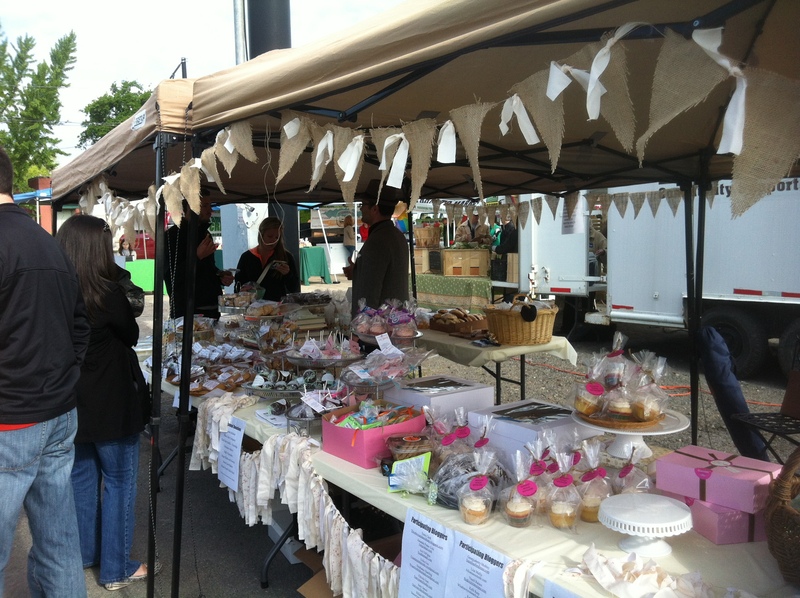 And a special thanks to the awesome folks who decorated and handled the crowds on Saturday at the sale itself! Meanwhile, my competitive spirit is still fired up. I’m not sure what all the sales across the country have made, but I know we’re in the top tier. Duncan Hines is donating an extra $10,000 on behalf of the bake sale with the biggest total… It could be Arkansas! Oh, and one more thing: Those of us on the Twitters wondered why we didn’t see the national buzz very well. Turns out all the sales didn’t use the assigned #FBBakeSale hashtag (tsk tsk), but did their own. Check out #SDFBBakeSale, #CFLFBBakeSale, #SFBakeSale and #NYCBakeSale for what other folks did across the country. THANK YOU, thank you, thank you! That’s from the bottom of my heart, and from all the kids and families who will benefit from your hard work. Thank you.